This is better than I ever even imagined ... so many compliments and people ask me where I got it I’m thinking about buying another one before they run out . This Amelia storage ottoman is transitional in design with a button-tufted, removable quilted top and oak legs with a rich espresso finish. 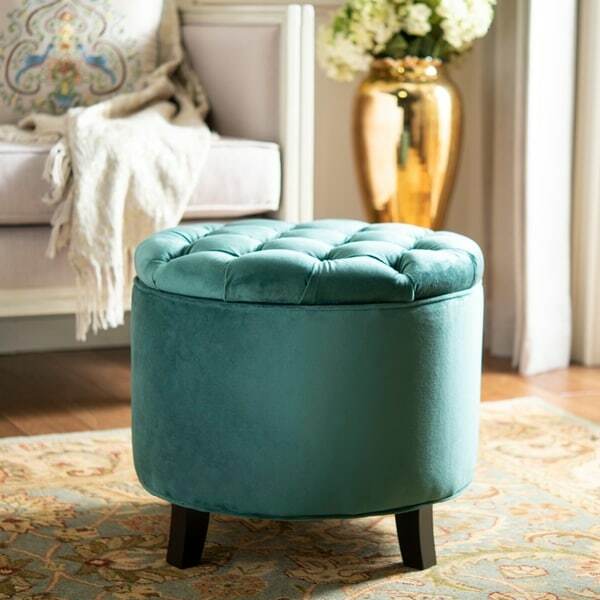 Practical and fashionable, the Amelia tufted ottoman is upholstered in marine blue cotton velvet. Dimensions 19.6 in. H. x 20.8 in. W. x 20.8 in D.
I have been looking everywhere for this teal green color - the ottomans I received are EXACTLY as shown! They are perfect in size - not too big not too small. Round with fabulous tufted tops - very well constructed - storage if you need it or sturdy enough for a little extra seat. Very happy - love these and would highly recommend. The material is suede-like - easy to clean and will wear well. I found the Amelia ottoman at a different discount site and ordered it there, but later found it at Overstock for more than $50 less and ordered it here after cancelling the first order. This ottoman looks great in my walk-in closet and I use it for seating and extra storage. It is SO gorgeous and looks much more luxe than the price. The color is incredible and so on trend, and the fabric looks and feels rich. I use this for putting on footwear and the legs are sturdy, even when I'm tugging on certain troublesome boots! The Safavieh Amelia would look great in a bedroom or living room as well, and I highly recommend it. Color is accurate as pictured. Seat is cushioned and comfortable. The inner storage space is large enough to accommodate throw blankets or other items. Overall I would recommend this to anyone looking for a storage ottoman. I love this thing. I live in a tiny apartment so I bought this to be a footstool for my easy chair (as I don't have room for a couch), as well as occasional extra seating and storage. It serves all those purposes and looks great, too. I use it as a stepping stool when I hang pictures or need to reach a high cabinet. It's very well made and easy to clean, and pet hair doesn't stick to it either. The teal color in person is rich, neither garish nor bright. If I had the room, I'd buy another. It's high enough to properly elevate my feet in line with my couch, which is the priority. Other than that, though, it's just beautiful. The color is rich and the tufting is a sweet detail. The feet come attached. I simply lifted the box off and turned it over. I can store my couch blanket inside, which is really handy to try to keep my room tidy. Exactly what I'd wanted, although at first I thought the color was a bit too green, and thought I'd return it. But, when I put it in the intended spot next to our greenish-teal curtains, it was just right!!! Beautiful, lovely velour fabric that can be cleaned using a soapy moist sponge, nice roomy storage area, darker wood feet - all just as I'd wanted and hoped. Definitely recommend! Nice and sturdy ottoman. Beautiful color. I would call it Teal. Did not have to assemble anything. It's reallly pretty when it comes out of the box, but the tufts/buttons get dirty and are hard to clean--especially when it is used for its intended purpose, which is to put your feet on. The legs are solid enough, although they tend to spin around sometimes. I think if it were in a place where it got less than daily use, it would be perfect--but daily use has made it look kind of dingy and worn out already. Love this ottoman. The color is true to the picture and it looks great with my living room furniture. Have gotten lots of compliments on it already. It was very well packed in a material bag inside the padded box, AND there was no assembly! Very happy with it. Beautiful teal color and is true to the picture. The extra storage is perfect for magazines or throws. Perfect height to prop your feet on when sitting on sofa or a chair. Small enough to move around the living room where you need it. Just as expected. Love it! Gorgeous and functional pop of color in my living room. Quality item and color spot on!! I ordered two of these. The legs when fully tightened do not face the same direction They look odd unless you loosen a few and have them symmetrical. The inside lid lining fell off the screws. "What is the weight capacity for this item?" Hello atticus123, This ottoman is beautiful! The color is called marine, which is a deep, blackened blue. It is not teal, but the blue does have a slight green-ish tint to it. I hope this helps. Thanks for shopping with us. YES - it is teal green/blue - more to the green like in the deep ocean. It is a jewel tone - very deep in color. I disagree with the "blackened blue" response. It is definitely teal GREEN tone - I am a decorator and pretty good with color notations. I bought one hoping it would at least not clash with our teal curtains (teal more on the green side than blue) - it matches them almost perfectly! Hope that helps. We both love it! The velvet is soft to the touch, and the top has lots of padding. Hello cariza, we appreciate your inquiry. The approximate shipping weight is 19 lbs. We hope you have found this information helpful. Thank you for shopping with us. Have great day!